One of the privileges of being involved with Ministry2Business is getting to meet a lot of people doing terrific work in different sectors and workplaces. One of the challenges I’m aware of is it’s very easy to feel isolated when it comes to living out our Christian faith at work. So, quite simply I hope these Spotlight interviews inspire and encourage us to see we’re not alone and we’re part of the bigger story that God is telling. Hannah has worked in Manchester with DWF since November 2014. She is the youngest trustee at Ministry2Business joining the team in 2017 and is part of Christ Central Church (Newfrontiers Family of Churches). 1. Tell us a little bit about your business story – how and why did you get into the legal sector? I enjoyed talking, new ideas and problem solving from a young age and it was therefore a natural choice to study Philosophy and Theology at University. It was here, through an essay, that I actually became a Christian and my enjoyment for argument, justice and business grew. After my degree I did some work experience within a law firm which resulted in a job in their risk management team. I absolutely loved it and was very lucky to be encouraged by the Directors to get involved with the business operations. During that time God was teaching me that business and in particular commercial law, had a significant part to play in his kingdom. As I read the bible I saw more examples of businessmen and women being used by God. Whilst, working for church and charities is essential and to be celebrated, God was showing me that equally, secular work was a place he wanted his children to be especially as influencers and leaders. This role led me into my current firm where I felt God remind me of a dream I’d had as a child to become a lawyer. During one of the Transforming Work sessions M2B hosted in 2016 we shared what would we like to achieve in work by the end of the year. I told the small group: “by the end of the year I will have a training contract at DWF”. After applying for the training contract and with some further study I am now a Trainee Solicitor at DWF based in Manchester. I love the way the legal profession can assist and support businesses. In particular I’m very passionate about helping clients bring change to their organisation. I believe God cares about business, and I see it as a great privilege to be working in law. 2. What have been some of the significant encouragements in your work over the last year? An encouragement in work has been working with my current supervisor and team. I was so nervous about starting the training contract but the people around me have been very supportive as well as challenging me to grow and develop in my work. Another highlight was working on our International Women’s Day event. The event I was part of involved working with a group of year 7 school girls who visited our office to discuss the importance of IWD, we had some guest speakers from a variety of businesses and we encouraged them to think about what they were dreaming for! 3. Your Christian faith is an integral part of your life – how does it impact and shape your work – where have you seen God at work in your work? My faith shapes my whole view of work, from simply motivating me in the mundane task of printing to the bigger moments of how I take criticisms and deal with disappointments. As a Christian, I know that I am a child of God, he has created me to work and I should work with the highest integrity. When someone constructively criticises me I can respond positively and learn from it because my hope and affirmation comes from Jesus Christ’s opinion of me, not the changing opinions of colleagues. This security in my identity is something God has really grown in me through my experiences at work. It also means that as I know God’s grace in my life I am aware that I will fail, whether that’s in a task I am asked to do or through my response to a situation. In those moments I am drawn closer to Jesus – that’s when I learn what it means to be humbly dependent on him. 4. What’s a key lesson you’ve learned, or best bit of advice you’ve been given, and applied in your work? The best advice I have had is to be faithful in the small things and the bigger things are more likely to be given to you. Whether that’s printing a Partners bundle right or managing the small finances you have as a start–up business. Don’t be scared to apologise when you have made a mistake and then take responsibility for it. I know we instinctively want to protect ourselves, but when we take responsibility for our mistakes it’s counter-cultural in many work environments but it is super powerful. 5. What tools have you found helpful to keep growing in your faith especially in the context of weekly work? For me its worship – I am loving the new album by Evan and Eris (Seasons) and Lauren Daigle. It keeps me focused on who I am working for and on days when it’s hard it reminds me who my Heavenly Father is. I have directly benefited from M2B through their meetings but also meeting with Pete Horlock to discuss work and my faith. I have a prayer group and I’m an active member of the Lawyers’ Christian Fellowship (LCF) which gives me space to explore my faith in the context of the legal field. 6. Finally, if you were stranded on a desert island and could have one luxury what would it be? Something that I could play music from, maybe a phone or speaker (with a solar charger ha!). I love music and not sure I would be able to survive without it. One of the challenges I’m aware of is it’s very easy to feel isolated especially when it comes to living out our Christian faith at work. So, quite simply I hope these Spotlight interviews inspire and encourage us to see we’re not alone and we’re part of bigger story that God is telling. 1. Tell us a little bit about your business story – how and why did you get into your business? Like most people in our industry I stumbled into the world of recruitment, but quickly found that my life experiences, divinely inspired talents, passions and gifts landed well within the industry and that cocktail of gifting and blessing has allowed me to become moderately successful throughout my career. Over a twelve year period I have been fortunate to serve within the athletic, education, healthcare and FMCG industries with the majority of that time primarily tuned into the food & beverage marketplace. In that period my experience has allowed me to directly support a wide range of organisations from local, family-owned enterprises to internationally based blue-chip multinationals with recruitment offerings including confidential head-hunting as well as RPO (Recruitment Process Outsourcing) campaigns. Throughout it all, I have worked hard to remain a faithful and confident witness to Jesus and wherever I have been based I intentionally sort out opportunities to proclaim the excellencies of God through both my working lifestyle as well as with my lips. In early 2018 I responded to the call of God to become bi-vocational and began the process of establishing my own business as well as planting a church within the Wythenshawe area of South Manchester. In August 2018 Christian Jobs Ltd was formed and with the Lord’s blessing CCM: Wythenshawe will launch in September 2019. At the time of writing, Christian Jobs Ltd has 6 employees dedicated to connecting Christians with Christian opportunities via our newly launched advertising and employment platform www.christianjobs.co.uk and the church plant has seven families regularly gathering to build community together. Early on, something I felt the Holy Spirit ask me to be obedient towards was the location of our office facility. In order to love people I believe we have to get close to them and be in their world. I believe that proximity declares intentionality and so with that in mind we looked for a facility that would allow all that we believe as Christian workers to manifest itself before the eyes of the community I feel called to serve. So, after a brief contract at a serviced office near the airport we found our office base right in the heart of the Wythenshawe community at the Enterprise Centre in Benchill. This facility is one that homes a number of small business operations and non-profit communities and it has been brilliant to regularly interact and dialogue with all the different types of people based here and not only show them that we’re competent at what we do, but that we do it from a love for Jesus who has transformed the way we both view and participate in work. As I write this I’m reminded of something that happened just this morning. I had the personal joy of praying a prayer of healing over one of the occupants of another office. This is the first time I have been able to do this, and in such a public manner and we’re praying that we would become more obedient to the Holy Spirit’s prompting to love those he has put in close proximity to our business in similar ways. Every morning our entire team gathers for prayer as part of our morning meeting. We spend 30 minutes thinking, pondering and praising Jesus at the same time that we go through our tasks for the day. We view our actions in light of our prayers and tie the two together intentionally. Often these meetings will be interrupted by a mail delivery or facility notification and this has led to some great times of questioning. We are not ashamed of who we are and who we belong too, and so it’s been a great joy to see our team confidently witnessing to the love of Jesus in their lives before those who are yet to know Him. For me personally I regularly hear and remember the words of Christ in John 15:5 “without me you can do nothing”. This echoes throughout my day and reminds me of my utter dependence upon him. This means that whatever endeavour I am involved within I must sink it into prayer and not lean on my own understanding or abilities – tough for an A type character. By displaying this personally throughout my work day, I have seen our team pick up on this and so it has been wonderful to witness this discipline in action from within our team. I am fortunate to work with a team that encourages each other through the highs and lows of the working day. In all of our interactions we get to see God loving and caring for us through us. It’s been incredible really, and a source of encouragement and growth for me as a leader to witness this so regularly played out by our team. “without me you can do nothing”. This echoes throughout my day and reminds me of my utter dependence upon him. To remember your why. I am a person of high capacity and spin a lot of plates so remembering what God has said to me is critical to keep me from becoming too distracted and unfocused. 5. Finally, if you were stranded on a desert island and could have one luxury what would it be? I’m greedy so I have to say two things. Firstly, a football. I’m a Sheffield United fan (its my thorn in my side!) and a sports fan in general so having something to kick about would help distract me. Secondly, I would have a pot of Luciane’s home-cooked rice. She is from Brazil and cooks rice with onion and lots of garlic that is so incredible it doesn’t need anything else to accompany it! It would probably last less than a day with my appetite, but would be worth it. 1. Tell us a little bit about your business story – how and why you got involved with Projekts Mcr? I discovered skateboarding around the same time that I really started to take my Christian faith seriously, just before I started university in 1999. Shortly after graduating, I was invited to work with a start up social enterprise called Projekts Mcr, which was a group of Christians who were aiming to make things better for skateboarders in Manchester. Initially I thought it would make a great year out between uni and work but once I began to see how little development was going into skateboarding at a grassroots level and how very few Christians were involved in skateboarding on a development level, I just decided to carry on. I enjoyed seeing the change and the impact of the work we were doing – it’s quite addictive. 2. What have been some of the significant encouragements in your work? Seeing skaters in the skatepark enjoying the ramps is a big encouragement. It means we’ve created something that the skate community really wants. But the biggest encouragement is hearing the stories from users about how we’ve helped them get through some very difficult times. It’s easy to think of the skatepark as just another space to play or just another activity centre, but it’s not really like that for most people who come here. For many skaters, it’s the centre of their community, where they feel supported and safe. 3. You’ve recently launched a Community Share Offer to help fund the expansion of the park – what’s your vision for the park and what support are you looking for? We’ve launched a community share offer to raise the funds to expand because we’ve reached capacity and we want to keep on growing. The land under the flyover has very little commercial value but it’s ideal for skateboarders because it’s covered by the Mancunian Way and stays dry in almost all weather. The idea behind the expansion is to build 700sqm of concrete ramps, making us the largest managed concrete skatepark in the country. 4. Your Christian faith is an integral part of your life – how does it impact and shape your work? I want what I believe to impact every area of my life, including work and I hope that my behaviour and what I say might point people to God and at the very least not be a barrier to someone wanting to know God. Jesus’ life and teaching is all about relationships – with God and with other people – and I would hope that in any interaction with people in work or through work, I might reflect God’s attitude. 5. What has been a key lesson you’ve learned especially as a young business leader? It’s the painful lessons you remember the most, isn’t it? It’s not always easy but I think employing the right people – people with the right attitude, primarily – is a big one for me, especially with the kind of work we do, working with young people and building community. It’s obviously easier said than done but it really pays to take extra care when taking someone on. Thankfully, we have an incredible team at Projekts – very supportive, keen to make a difference, hard working, caring, patient and excited to be part of a growing organisation. During the first two weeks of the 2017 Manchester Christmas markets, nearly 80,000 mugs were sold (45,610 coffee mugs and 33,000 Gluhwein mugs)! With more than 9 million people visiting over the 6 week period, 2018 looks set to be another record breaking year. Manchester Christmas Markets officially open on Friday 9th November through to Saturday 22nd December with the city’s Christmas lights switch-on takes place on Saturday November 3rd. Launched in 1999 as just a single site in St Ann’s Square, the markets now sprawl across the city and attract millions of visitors each year. This will be the last year that the markets main hub will be hosted in Albert Square due to the refurbishment of the plaza and Town Hall. New for this year’s Christmas Markets is a magical Ice Village in Cathedral Gardens. The highlight will be a walk- through Ice Cavern experience filled with intricate ice sculptures including a steam train, mischievous elves, enchanted toys and Arctic animals – all set against the backdrop of a frozen toy factory. There’ll also be sculptures telling the story of Manchester, including a female train driver with a ‘Votes For Women’ badge as a nod to suffragette Emmeline Pankhurst, as well as other legendary Mancunian symbols like football, music and Manchester’s worker bee emblem. There’ll also be an ice skating rink, a Santa’s Grotto and the Polar Bar, where visitors can warm up with a mulled wine or hot chocolate. Original article written by Emily Heward for the MEN. Internet giant Amazon has announced it is opening a corporate office in Manchester and is bringing 600 jobs to the city. The Hanover Building which will serve as Amazon’s home is located in the NOMA area of the city, in a move that is a major coup for the region. The aim is for the Manchester office to open in 2019 – bringing hundreds of new jobs to the city. Hanover Building will be Amazon’s first UK corporate office outside of London and will be home to a wide variety of teams. The teams will work on projects that benefit Amazon’s customers around the world, including software development, machine learning and research and development. New employees at the Manchester office will complement teams working on global innovation in London, Cambridge and Edinburgh. Amazon has committed to creating 2,500 jobs in the UK in 2018, taking its total UK workforce to over 27,500. The region’s property elite were in the spotlight at last night’s annual North West Property Awards. Developments that have transformed the skyline of North West towns and cities, such as No.1 Spinningfields, were celebrated along with the teams of planners, lawyers and architects that made them a reality. To mark the 20th anniversary of the awards, Insider also teamed up with the BBC on a new prize – Building of the Decade – which was voted for by North West Tonight viewers. Sam Lawson Johnston and George Haddo have spent more than £40m acquiring, renovating and then leasing historic buildings in Manchester including Canada House and the Northern Assurance Buildings. Integral to the new Alder Hey Children’s Hospital building, which was completed in 2015, was the input of the children, all current or former patients, who voted on the schemes and designs they liked. Lynda is divisional chief executive of MAG’s property business and is responsible for investment and development across its three airports. Her remit also covers the 3.5 million sq ft Airport City Manchester development.Lynda Shillaw, divisional chief executive of property at Manchester Airports Group, took home the Property Personality of the Year accolade. A sculpture of a homeless Jesus sleeping on a bench was unveiled by Dave, a homeless person, outside St Ann’s Church. ‘Jesus the Homeless’ is a near life-size bronze sculpture by the Canadian artist Timothy Schmalz. It depicts a figure lying on a bench, with its pierced feet indicating it is Jesus. Facing a growing problem of homelessness in the city and a global crisis of people displaced by war and conflict, the figure challenges passers-by to question their attitude towards homeless and marginalised people that they come across in their day-to-day lives. Churches across Greater Manchester have responded to the growing homelessness crisis by developing a clear plan of action in partnership with others. City churches open their buildings every year to help provide winter night shelters and other frontline services for homeless people. St Ann’s is also working on a pilot project for street homeless people called ‘Morning Hours’ which provides a warm space, hots drinks and toast, first thing in the morning before any of the city’s day centres open. Metro Mayor Andy Burnham has announced his strategic resolutions for 2018 calling on Manchester to reapply it’s radical and pioneering verve. 2018 marks both the 150th anniversary of the founding of the Trades’ Union Congress (TUC) in Manchester and, on 6th February, the centenary of the passage of the Representation of the People Act 1918 – granting votes for women for the first time. It was a victory won by Moss Side-born Mrs Emmeline Pankhurst who inspired and led the Suffragette movement and is acclaimed the greatest northerner in history in a recent poll. Mr. Burnham’s 5 resolutions included support for those affected by the Arena bomb last May and continuing to press government for more funding for Greater Manchester’s emergency services . His fourth resolution is to initiate a major overhaul of the transport system. The increasing level of congestion on the roads reflected the fact that public transport was “simply not good enough”. Mr Burnham pledged to use new powers to change the way local buses worked as well making the case for new investment in infrastructure. His fifth resolution is to continue to build the voice of the north and make the case for more devolution: “If we are to rise to the challenges of Brexit, we need to develop a world-class digital and transport infrastructure and have the freedom to innovate on policies which Westminster has traditionally neglected, such as technical education. Manchester-based online fashion retailer boohoo has raised its guidance for full year revenue again to be 80% ahead of expectations, as it posts a 106% increase in half year turnover to £263m. It was only in June that the company said it expects full year revenue to February 2018 to be 60% ahead of expectations but today’s half year results show the incredible pace of growth, with six-month pre-tax profits up 41% to £20.3m to the end of August 2017. In June the company raised £50m on the stock market so that it could build an automated super-site of over 600,000 sq ft, which will provide it with over £2bn of net sales capacity to keep up with demand. The boohoo brand continues to account for the majority of revenue at £182m but the company’s Pretty Little Thing brand, which it acquired at the start of the year, is seeing incredible growth with its half year revenue of £73m up by almost 290% on last year. Nasty Gal – it’s latest addition – had a turnover of £8.4m from March, with sales growing month on month, the company said. As well as the introduction of new brands, boohoo has also expanded its range and plus size, curve, petite and menswear have been the categories with the highest sales and strongest growth, whilst the more recently-introduced boohooKids, maternity, lingerie and tall ranges are also showing high rates of growth. The company said its growth was largely attributable to international markets as it continues to increase market share overseas. On 16th October 2017 Old Trafford Cricket Ground will host Manchester’s 2nd CEO Sleepout. 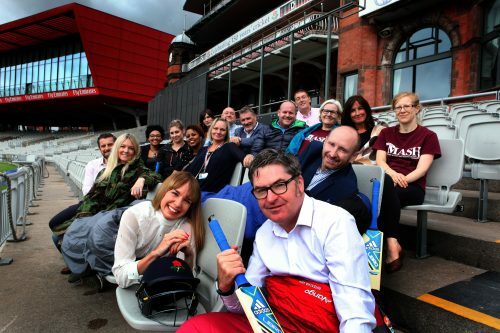 More than 80 business leaders will give up one night of comfort, sleeping out under the stars, at the iconic home of Lancashire County Cricket Club in a bid to fight poverty and homelessness in Manchester. Jenna Bowyer (Business intelligence developer at Boohoo.com) and Julie Wilson (co-founder of Rule 5) are among the group of prominent business women taking part in the sleep out. Statistics from national homeless charity Crisis show that while the vast majority of rough sleepers are male, life for women on the streets can be particularly bad, with one in four women sleeping rough having been sexually assaulted in the past year, three in 10 being the subject of sexual violence while homeless, and six in 10 being intimidated or threatened with violence. Since its foundation in 2013 by businessman and philanthropist Andy Preston, CEO Sleepout has raised more than £1m thanks to support from thousands of executives participating in its sleepouts. In 2016, 87 Manchester business leaders raised £64,000 by sleeping rough with the scheme. Ministry 2 Business was part of a small team that helped establish the initiative in Manchester. You can find out more about CEO Sleepout on the website.